While Earl Gray tea is a healthy beverage that's safe for most people in moderate doses, drinking too much may cause side effects. As a black tea, Earl Gray has most of the same effects as a plain black brew. In addition, however, it is flavored with oil from the bergamot orange, which may lead to other side effects. Like all teas, Earl Gray contains caffeine, a stimulant that acts on the central nervous system. Up to 5 cups of tea per day is considered moderate intake, according to MedlinePlus, but you may get too much caffeine if you consume more. This may lead to anxiety, heart palpitations, tremors and sleeplessness -- and some extrasensitive people may experience these effects after drinking just a small amount. With everyday sipping, you may also become dependent on caffeine and experience withdrawal symptoms such as headaches and irritability once you stop. Tea contains tannic and gallic acids, two compounds that interfere with absorption of the nonheme iron found in plant foods such as beans and leafy greens. Depending on how much of these acids are in your cup -- which varies by brand, strength and steeping time -- drinking tea with a meal may reduce iron absorption by up to 75 percent, according to Marla Reicks, nutritionist at University of Minnesota Extension. 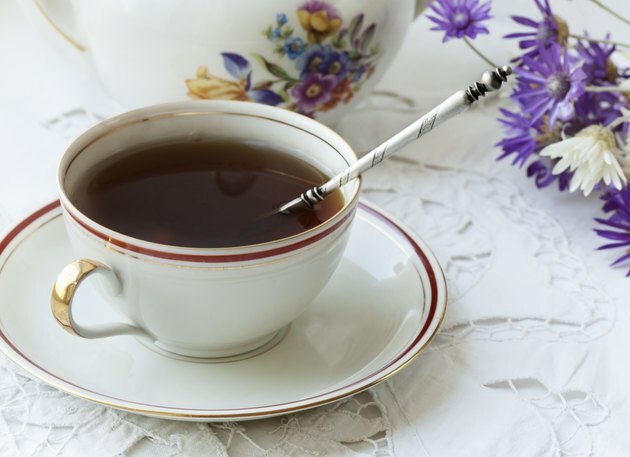 To ensure adequate iron absorption, drink Earl Gray between meals, not with them. The tannins in tea can transfer to your tooth enamel, staining your smile -- and black teas like Earl Gray stain more than green tea and other lighter varieties. To help prevent staining, rinse your mouth or brush your teeth as soon as you finish drinking. Also, floss every day to help eliminate plaque. Drinking large amounts of Earl Gray tea may cause you to ingest too much bergamot oil. The oil contains a toxin called bergapten, which may affect potassium absorption in certain neurons and lead to muscle twitches, cramping in the hands and legs, prickling or burning sensations, pressure in the eyes or blurry vision, according to Washington University Neuromuscular Disease Center. The center notes that these symptoms generally disappear within a week of discontinuing Earl Gray tea. If you experience any of these effects, however, see your doctor for a diagnosis and treatment options. Does Drinking Tea Affect Your Teeth?